When the Saucer Magnolia tree puts on its floral display in winter, from late January through mid-March, you feel like spring has come a bit early! Its “cup-and-saucer-shaped” flowers (rather large at 5 to 10 inches across), burst out, one from each branch tip, standing upright in the cool winter sunshine – and are delightfully fragrant. Their petals are white on the inside and pink-tinged on the outside. Surprisingly, these flowers only emerge after the tree has dropped all its leaves, making their showy appearance on bare stems even more dramatic. In the summer and fall, when the flowers have been pollinated and their petals have fallen, a lovely broad-spreading rounded canopy of leaves appears, with luxuriously shiny dark green leaves 3 to 4 inches wide and 5 to 6 inches long; these turn an attractive soft brown color as they age. In early winter, when the tree is fully dormant, its smooth, gray bark shows off the delicate branching form. The Saucer Magnolia can be grown as a multi-stemmed large shrub or as a low-branched small tree that can grow to 20 feet or more in height and to 25 feet across. 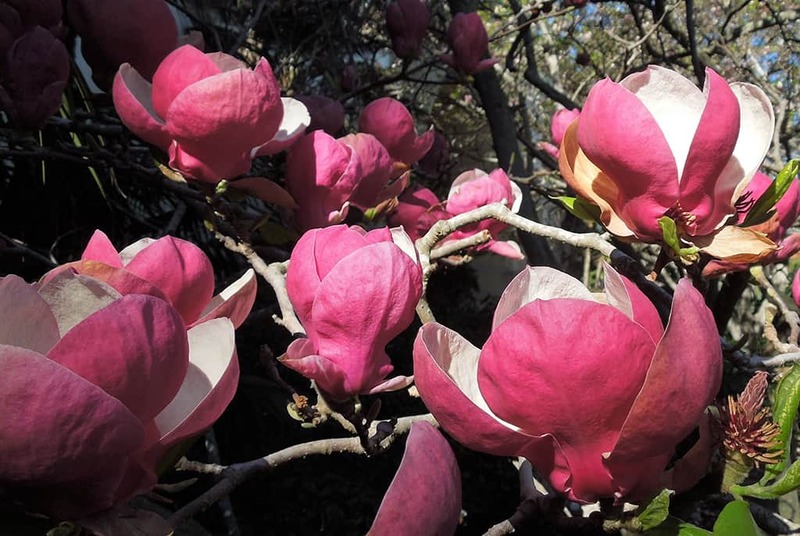 It is tolerant of many types of soil (including alkaline, which can negatively affect other magnolias), but prefers well-drained loam; it can be planted in full sun to partial shade. It does very well in our Mediterranean climate, but should receive regular irrigation during the dry season. The fact that it doesn’t have any serious insect or disease problems makes it even more desirable. 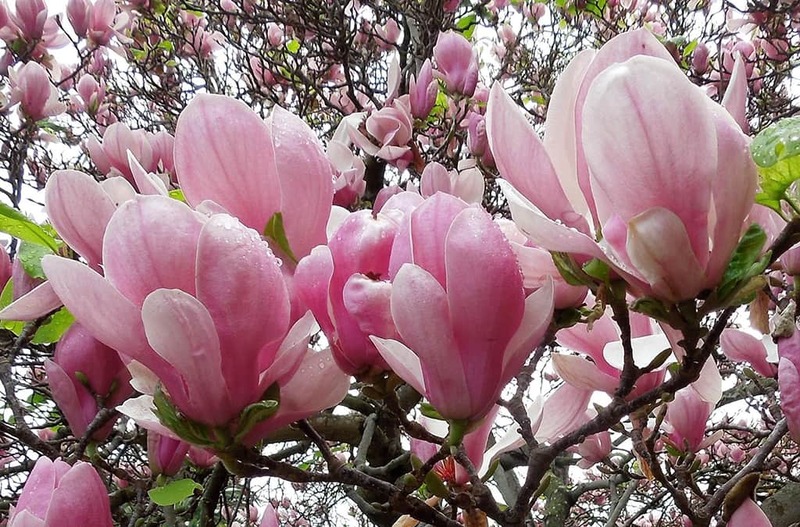 While the Saucer Magnolia is one of the most widely planted of the magnolias, easy to cultivate, and readily available, there are large numbers of related cultivars which have other flower colors, ranging from all-white to deep burgundy. The Saucer Magnolia is a hybrid, a horticulturist’s creation, a mix of two Asian magnolias. Its botanical name is Magnolia x soulangeana. The genus Magnolia honors the French botanist, Pierre Magnol, and the specific epithet acknowledges another Frenchman, a retired cavalry officer in Napoleon’s army, Etienne Soulange-Botin, who developed this lovely hybrid at his chateau in 1826. 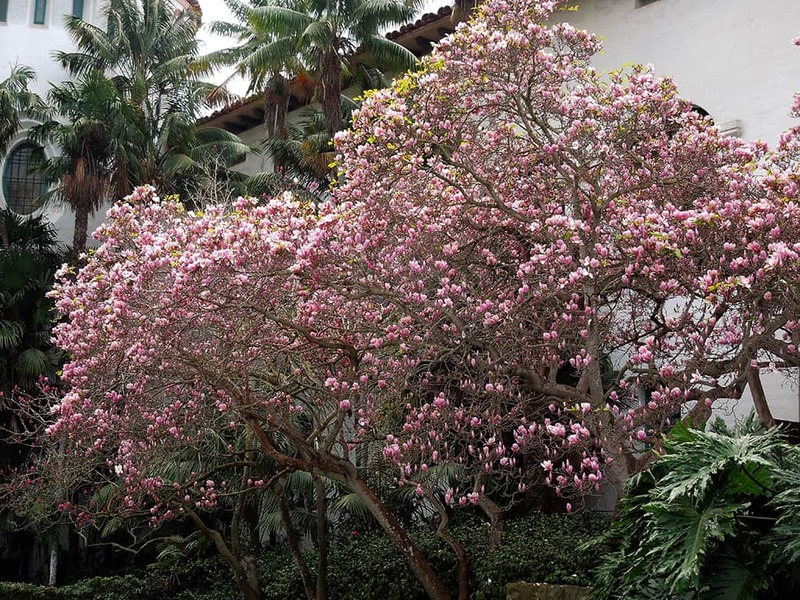 In Santa Barbara, the best examples of Saucer Magnolia are in the gardens of the County Courthouse (just east of the archway), where there are specimens of the pink and of the burgundy colored cultivars. Other examples in public view are at the Alice Keck Park Memorial Garden (along the Santa Barbara Street side) and at the AIA office building at 229 E. Victoria Street. They are also seen in many private gardens all around our town.